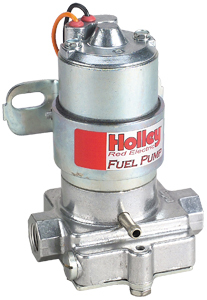 Proven winners over the years thanks to their lightweight design (2.88 lbs) and ability to tolerate contaminated fuel, these Holley fuel pumps are powered by a long-life, heavy-duty, sealed-dry motor. They have a relief valve for pressure compensation and washable inlet filter screen that cleans fuel as it travels between the 3/8" inlet and outlet ports in the aluminum housing. Redesigned flow passages improve durability, reduce amp draw, and eliminate pulsation, which provides a higher, more consistent flow. The marine pump meets USCG regulations.